The Shell to Sea campaign is making a fresh call for whistleblowers to come forward to expose malpractice and corruption in the facilitation of the Shell Corrib gas project. The call comes in the wake of the publication of the Guerin report and against the backdrop of the ongoing criminalisation of protest against the imposition of the Corrib gas project in Co. Mayo. Shell to Sea spokesperson Terence Conway said: "We are calling for more whistleblowers from within the ranks of An Garda Síochána, Shell, Shell subcontractors and any State agency involved in facilitating the Corrib gas project to come forward and assist us expose the corrupt practices used to date in attempting to force through this dangerous project." 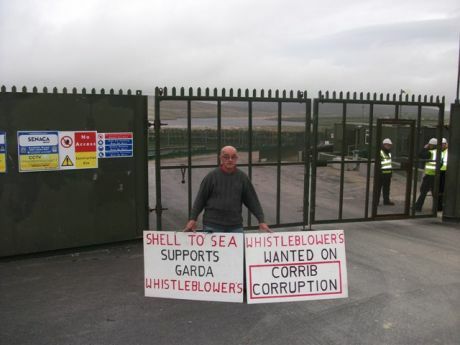 He was speaking after yesterday's sitting of Belmullet district court where three Shell to Sea campaigners were appearing on charges arising from a mass protest at the main Shell work site for the construction of the onshore Corrib gas pipeline. So far one former Shell subcontractor - OSSL - has already come forward exposing the corrupt delivery of €35,000 of alcohol to Gardaí drafted into Mayo in 2006 to police protests. Shell to Sea spokesperson Maura Harrington added: "Despite Shell's many attempts at powerful spin and their continued handing out of beads and baubles, the final determination of the Corrib gas project is by no means a foregone conclusion. There are a number high court cases yet to be heard, and along with the current unease of people all over the country, it remains to be seen how this saga will finally turn out." Corrib whistleblowers may contact the Shell to Sea campaign at mayoshelltosea@gmail.com or by using the feedback button at www.shelltosea.com.